George and Abby Nauman built Jumble Coffee Company from the ground up. But that never would have happened, George said, without the financial support and expertise of his lifelong financial home, which has since become his commercial lender too. Dupaco Community Credit Union believed in Jumble Coffee, loaning George the startup funds he needed to leave his job in the fast-food industry and create an organic, fair-trade coffee shop on Dubuque’s Wacker Drive. When George has needed additional financial support, Dupaco has continued to be there for him. But George’s relationship with his credit union goes beyond dollars and cents. “If I just wanted the money, I could have taken it and left. But I have always been at Dupaco for their business advice as well,” he said. The former fast-food manager set out to do away with all the parts of the fast-food world he didn’t care for and keep the pieces that work. Serving quality, earth-friendly products was key. 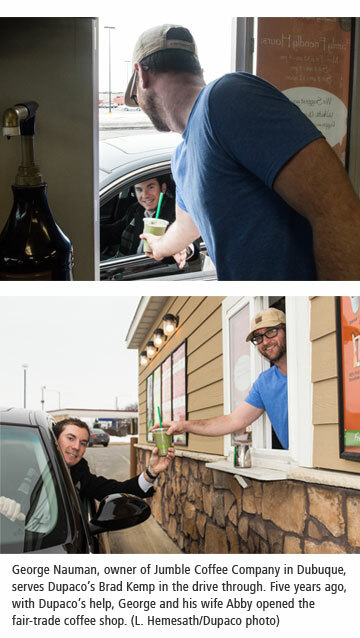 George kept the convenience of the drive-through window—Jumble Coffee features a two-sided driveup. But he eliminated the lobby and packaging waste that comes with traditional fast food. The coffee shop uses packaging made from corn, which is compostable. Jumble Coffee features Americanos, lattes, tea, 100-percent-pure fruit smoothies, pastries, all-natural breakfast burritos and more. Parents of four, the Naumans opted for family-friendly hours. The store closes at 4 p.m. every day except Sunday, when it closes at noon. Jumble Coffee—whose motto is “Something simple in a jumbled world”—has been open for more than five years. George said opening a business requires a lot of luck and good timing, which makes him all the more grateful to be part of a business success story. While Jumble Coffee is the only business he owns, George has visited Dupaco’s commercial lending department several times to bounce his latest ideas off those he trusts. Awesome coffee drinks and really pleasant service. Can't beat it! Jumble Coffee Co. is a great asset to our small business community, and we�™re happy to have the privilege of helping them grow!